A laser generates an intense beam of light. This beam brings energy to a specific site, through a small hand piece connected to the laser console. The laser light is absorbed by oxyhemoglobin (bright red blood cells carrying oxygen) and melanin/pigment (black or brown pigment found in the skin) causing decomposition or destruction by heat of unwanted cells while leaving health cells intact. A vascular lesion is formed by abnormally large or numerous blood vessels located directly under the surface of the skin. These vessels may be visible through the skin or result in a red appearance of the skin. Spider Angiomas, are examples of vascular lesions. Melanin is the dark pigment present in skin and is produced by melanocytes. Pigmented lesions occur when an abundance of melanocytes are found in the skin. When dark pigment multiplies, it forms freckles, brown age spots and moles. Lentigines are an example of a pigmented lesion. What should a patient expect during and after treatment? Treatment may vary, depending upon patient characteristics and the area being treated. You will be asked to wear special goggles to protect your eyes from the intense beam of laser light. You will be placed in a reclined position depending on the location of treatment. The doctor will use a “pencil thin” handpiece to direct a beam of laser light to the lesion. In most cases, anesthesia is not required. Some patients report feeling a slight stinging sensation during the treatment followed by some redness which usually goes away in 2 – 4 hours. Some swelling may also be experienced and may last 1 – 2 days. There will not be any purple skin discoloration or bruised appearance ot the treated skin. Postoperative care is minimal. Your doctor may ask you to use an anti-bacterial ointment on the treated area for a short period of time and will suggest that you stay out of the sun during the healing process. Final treatment results should be evident within 10 – 14 days after treatment for vascular lesions and within 2 – 3 weeks after treatment for pigmented lesions. In the meantime, normal daily activities can be resumed with only a slight redness evident at the treatment area. What does the laser look and sound like? The laser is small – about the size of a VCR. As pulses of energy leave the end of the handpiece fiber, you will hear a soft beeping sound. What conditions are treated with the laser? Spider Angiomas – slightly raised, red spider-like lesions. Rosacea – red facial lesions around the nose and cheeks causing a sunburn look. Lentigines – flat, brown spots on the skin; present on skin with frequent sun exposure. Keratoses – slightly elevated pigmented spots often found on the back and hands. Freckles – brownish spots on the skin; common on people with fair skin. Dermatosis Papulosis Nigra – small black marks seen primarily on people of Asian or African descent. 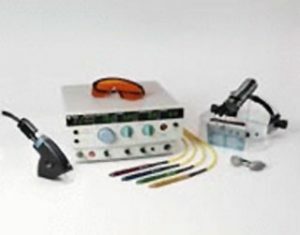 As a patient, what does the laser mean to me? What are the benefits? Excellent and consistent outcome – minimal to no discoloration, swelling or complications. Friendly and gentle treatment – typically performed without anesthesia or pain. Comfortable surroundings – treatment is performed in your doctor’s office and takes only minutes. Ask your doctor. After a brief examination, we will determine if laser treatment is appropriate for you.